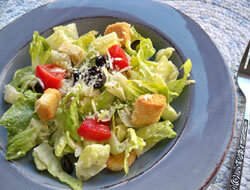 A great salad that can be thrown together at the last minute for a nice addition to any meal. It is a nice side dish for pasta, fish, and grilled meats. 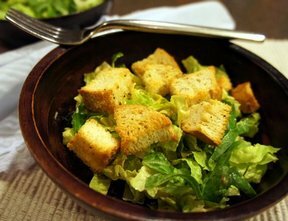 Tear the lettuce into bite size pieces and place in a bowl. 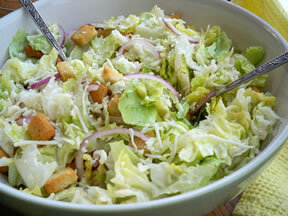 Add the onion slices and Parmesan cheese (reserve a little cheese to sprinkle on top); toss to mix in with lettuce. Blend the dressing ingredients together; pour over combined lettuce and onion. Top with croutons and reserved Parmesan cheese. "The dressing was very good for this salad. I used head lettuce because the supermarket didn't have any nice Romaine when I picked up groceries. I think this salad would be even better if made with Romaine lettuce. It makes a lot of dressing. I only used about half of it and saved the rest and used on my salads I took for lunch at work."